The Institute for Zen Studies was founded in 1965. Since it came under the direct control of University in 1980, the Institute has undergone considerable development. At that time, a new Research Center with a traditional Zen Meditation Hall was built in the serene part of the university campus where the verdant woods contrast beautifully with the white sand garden. The ideals upon which Aichi Gakuin University is established are "the Unity of Learning and Practice" and "a Profound Sense of Gratitude toward the Whole World". Guided by these ideals, staff members of the Institute are striving to study and to spread Zen Buddhism. 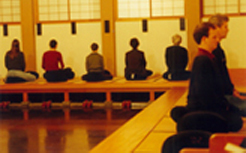 "Monthly Sessions of Zen Meditation"
"Hoko - Meetings of Zen Meditation and Lectures"
Hoko - Meetings of Zen Meditation and Lectures The Institute holds Monthly Meetings in the Hokodai Zen meditation hall on the Meijo Koen Campus. The meeting is called "Hoko", which means emitting light.